The Dragon's Tales: Turtles: Back to Parareptilia You Go! Turtles: Back to Parareptilia You Go! 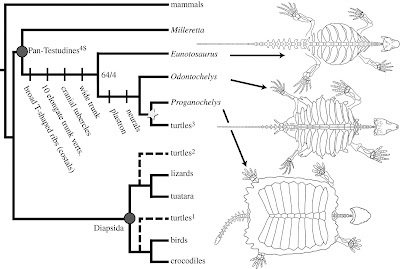 The position of turtles based on molecular (1: e.g. Hugall et al. 2007) and morphological datasets (2: e.g. deBraga & Rieppel 1997; 3: Gauthier et al. 1988). The addition of key fossils eliminates the apparent disagreement among morphological datasets in support of turtles outside Diapsida (3). The Permian ‘parareptile’ Eunotosaurus shares uniquely derived features with turtles that help fill important gaps in the evolutionary origin of the turtle shell. Bootstrap (top) and Bremer (bottom) support values are provided for the Eunotosaurus-turtle clade. Star indicates complete shell. * Author for correspondence (tyler.lyson@yale.edu). The origin of turtles is one of the most contentious issues in systematics with three currently viable hypotheses: turtles as the extant sister to (i) the crocodile–bird clade, (ii) the lizard–tuatara clade, or (iii) Diapsida (a clade composed of (i) and (ii)). We reanalysed a recent dataset that allied turtles with the lizard–tuatara clade and found that the inclusion of the stem turtle Proganochelys quenstedti and the ‘parareptile’ Eunotosaurus africanus results in a single overriding morphological signal, with turtles outside Diapsida. This result reflects the importance of transitional fossils when long branches separate crown clades, and highlights unexplored issues such as the role of topological congruence when using fossils to calibrate molecular clocks. The tug of war continues over the turtles! Once anapsida then parareptilia, then diapsida and back once more into parareptilia! Oy! That said, I am beginning to think that the molecular clock isn't nearly as regular as is often assumed. I get the distinct feeling that there are bursty times of rapid mutation and other quieter moments of stasis and little change. Perhaps the molecular clock just needs more fiber in its diet, eh? What molecular clock has to do with that? A closer relationship between turtles and crocodiles and birds is based on the molecular clock or similarity of molecular sequences? As far as I know, it's the latter, which makes very difficult to support a closer relationship based on morphological traits anywhere else. Further, it's a bit more complicated than just are turtles parareptiles or are they diapsids. For one thing, the diapsid camp is divided as to whether they are lepidosauromorphs (Rieppel, Mueller) or archosauromorphs (Bhullar and Bever, various molecular phylogenies). 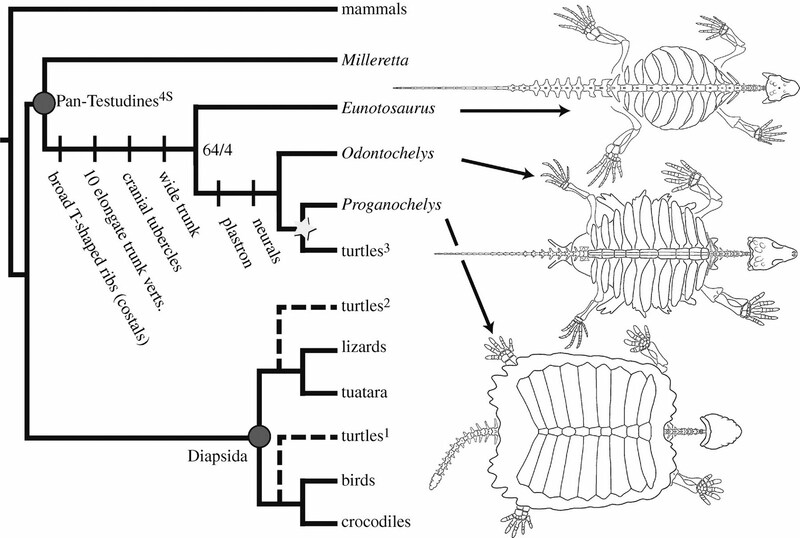 And within the parareptile camp, Lee (2001) found turtles to be related to pareiasaurids and the recent Lyson et al. (2010) paper found turtles to be basal ankyramorphs outside of the clade containing pareiasaurs, procolophonoids, and 'nycteroleters' (sensu Tsuji and Mueller 2009). I am currently preparing a supermatrix of sauropsid reptiles with some other individuals, and I know that these efforts are also being carried out by several other groups, so we'll see what results of these works in the time to come. Multicelluar Life is 2.1 *BILLION* Years Old! Arizona's Republicans Must be INSANE! Mesozoic Marine Reptiles Were Warm Blooded?! Is the Oort Cloud Alien? No, Really! Sauropods Were Dinosaurian Giraffes!